Remembrance service broadcast live on BBC Radio Wiltshire. “Uplifting” local remembrance service broadcast live on BBC Radio Wiltshire. A live broadcast, as part of a special BBC Wiltshire Armistice Day programme, featured the Service of Remembrance held at Maiden Bradley Memorial Hall on Wednesday 11th November. 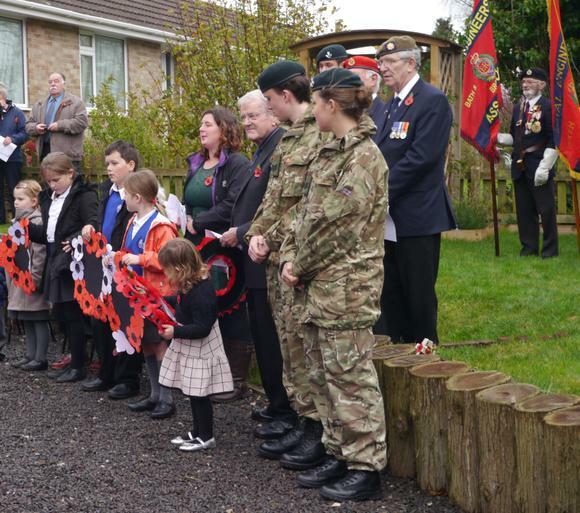 The service, lead by the Rev Carol Wilson-Barker, was held in the recently refurbished Maiden Bradley village hall to a full congregation including children from Whitesheet Primary Academy together with Army and Navy Cadets from Kings School, Bruton as well as local ex-servicemen and members of The Royal British Legion. The Whitesheet Primary children sang their own special remembrance song accompanied by their music teacher Mrs Jenny Lucas on piano and the school’s musicians on ukulele and recorders. The children also read out the names of all those from Maiden Bradley who had fallen in both World Wars. “The children did really well today - beautifully behaved, read and sang very well. People said it was uplifting and made extra special because they were there.” said the Rev Carol Wilson-Barker after the service. Whitesheet Primary pupils of all ages had made poppies for the beautiful homemade poppy wreaths which were produced individually by Woodpeckers, Skylarks and Kestrels classes - and laid by children from each class. Lee Stone of BBC Radio Wiltshire had, earlier in the week, interviewed the Rev Carol Wilson-Barker with the children from Whitesheet, about the service and what it meant to them, to accompany his live broadcast on 11th November.